The weekend is upon us. This week we will give you a sneak peak at the new interface, the shop and explain how the cutscenes have turned out. Lets start with the new interface. As we said last week iFest was the wake up call to make the interface brighter and more interesting to look at. 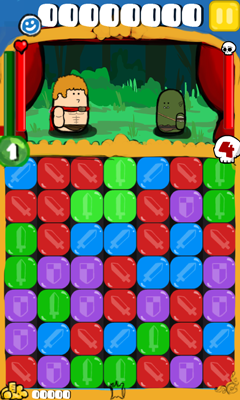 You can check out the concept I made for the new battle screen below. Firstly the boring greys of the borders have been replaced for a much brighter yellow and lovely blue. The major change however is the HUD (Heads Up Display) layout and sizes. These changes are fairly necessary as it helps draw the eye to the various aspects of each one. The big text the top is meant to make the score stand out a lot more. The experience bar now connects to your level bubble so it ties both of them together more so hopefully people understand they are connected. Taking health off the bottom of the puppets gives us more room to position and size them on the stage, also it should help drive home the fact which is your health and how much health the enemy has. The money you collect after defeating enemies is down the bottom as it isn’t as important to the gameplay as the other elements. Some may think its silly to spend more time on rearranging these elements but it can make a huge difference to your game. Moving these elements should make things more obvious and help accentuate what things are important gameplay-wise. 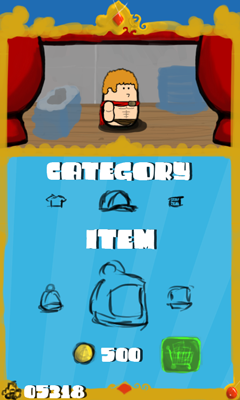 Next we wanted to show you what the general idea with the store is. If you have been following, you can customise your puppet to look however you want by changing things such as your hat, eyes, clothing, face accesory etc. The shop is going to be where you can spend in-game coins to purchase other items for your costumes. You will earn these coins everytime you defeat a monster, and the amount of coins will probably relate to how hard you hit them on the last hit. It’s always nice to be rewarded for playing games and so having cool items for you to buy and dress your puppet in is a nice way to say thank you. The final part of the devlog will be the current state of the cutscenes. Azza finished writing the code to handle them all and all thats left is to write lots and lots of content. We had a few ideas of how to so the cutscenes, and the obvious one is to just have the puppets come on stage and act their part. This does fit the puppet show theme to a tea however it reduces some of what we can do with the story. What we have ended up with is a sort of comic book style paneling where the puppets act their part and when the major bit of story is done there, the next panel lights up and progresses the story. We think this way it will be more exciting for the player, it also allows us to show a more complex story quicker and considering its designed as a mobile game its always a good thing. 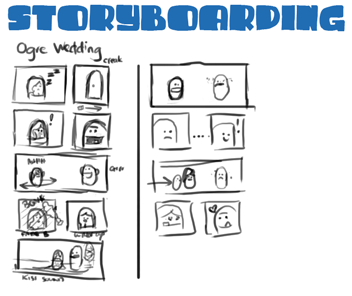 I’ve attached a quick story board i drew up this week of the Ogre Weddings opening and closing cutscenes. I have felt guilty that the last 2 entires haven’t had any eye candy so I’m trying to make up for it this week. It may be rather hard to tell whats going on with my scrappy concepting but I’ll give you the quick rundown of what the opening cutscene to this play is. Panel 1: The princess is sleeping in her bed. Panel 2: The door slowly creaks open. Panel 3: The princess is startled by the sound and wakes up. Panel 4: The ogre groom shows his face and says hi. Panel 5: The princess runs back and forth screaming. Panel 6: The princess gets bonked on the head by the ogres club and it fades to black. Panel 7: She wakes up in a wedding dress. Panel 8: It shows shes standing next to the ogre who is in a Tux and is making Kissing sounds at her. So the direction we are taking in the cutscenes is quick and cute. All the puppets will speak with chipmunk voices and express what they are feeling through their actions. This was a good way to make things easier for ourselves but also gives the player a chance to use their own imagination and fill in the gaps on what exactly might be going on or what the puppets are saying to eachother. Well that should do it for this weeks blog. Hope you are all enjoying reading this each week. Its looking like I will have finished making the new interface early next week and get onto that gameplay video I’m sure you are all waiting on. This will be a short update as we are still busy preparing for iFest tommorow. If you live in Melbourne, Australia feel free to come to the State Library opposite Melboourne Central Station and come play a whole bunch of indie games and listen to people in the industry talk about various subjects. Check out iFest for more details. If you do come down to see us you will be able to play our game on either of our 2 laptops or the phone itself. You will be able to chat and ask questions all through the day so dont be shy. There was a lot of polish this week, taking debug and testing cases out of the game. We added more particles and sound effects so there should be more feedback then ever in the game. Well sorry about the short blog post but we do aim at making some sort of gameplay video very soon so you can see the game in action. We hope to see some of you this weekend.